Not interested in trading but I have a couple of low seats that I'll sell. Post up or email a picture of your Corbin from the side and bottom. Does the bottom look this? The pictures of the bottom of your seats didn't show up Duck. I'll get some help posting the pictures of my seat this weekend. Sorry for the late reply. The bottom of my seat looks closer to the Corbin seat with the red piping in the second picture showing the seat bottoms. 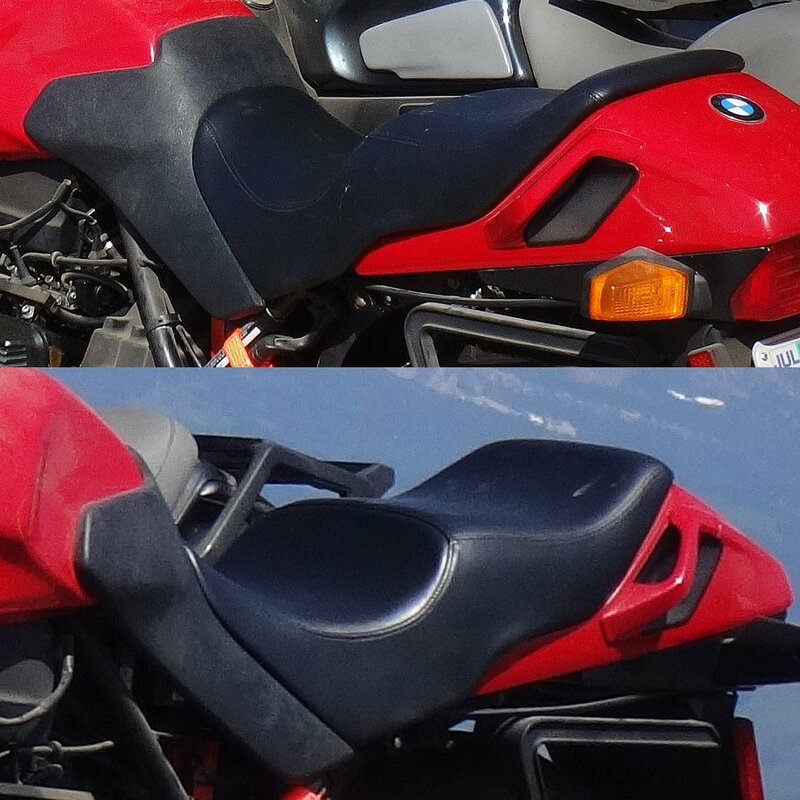 Would the stock low seat you show in the first picture work with the tank surround? Do you know if the stock low seat model that you have will fit in place with the tank surround and seat setup that I have? Yes, this is the seat I have for sale before I removed it to convert the donor bike back to a regular seat. Looks good. Can you give me a price with shipping and the altitude plug? My zip is 31405. I'll check back here in the morning. I may not be able to do that until Wednesday or Thursday . I don't have a box the correct size so I'll need to go to U-Haul to get a big enough box. The nearest U-Haul is a ways away and the roads around here will be covered with snow and ice for the next few days. Do you have the mounting hardware (latch and clips) for the low seat? I have a seat and want to lower one of my 75s's for my wife to try out (I would like to get her off her vrod so she can carry her crap personal gear). If so I would like to buy it from you, Thanks. I think I might but I'd have to look around for it. I can look for it next week when my garage is warmer. Do you already have a low seat? Yes I have a good seat and tank surround. She likes the vrod but on trips she can't carry any gear and stopping for gas every 100 miles for gas is a pain. Do you need the low seat brain box (L-Jetronic holder) too? I will try to dig out the parts you need but can't you try a low seat at least temporarily with just gravity and not needing all of the hardware? No on the brain box, I'm good there. I have the seat set up on the bike with rt bars and she thinks she will be able to ride it that way. I'm pretty sure once she get used to it she will like it better than her vrod, at least for touring.